Who out there over complicates something that just SCREAMS simple? (Raising my hand in the air while simultaneously hanging my head in shame.) Why do I do that? I mean, I fight for simplicity every day and try to streamline everything to make it more efficient. Handwriting is one of those subjects that is just TOO easy to teach, yet I always seemed to make it more complicated than it needed to be. This summer as I was looking at printing out and binding all the worksheets (x4) we had done last year I started brainstorming a simpler approach. “Why not have everyone do handwriting at the same time and even, possibly, be practicing the same letter!” LIGHT BULB! Wasn’t that how the one room school houses did it when they were teaching multiple aged children anyhow? 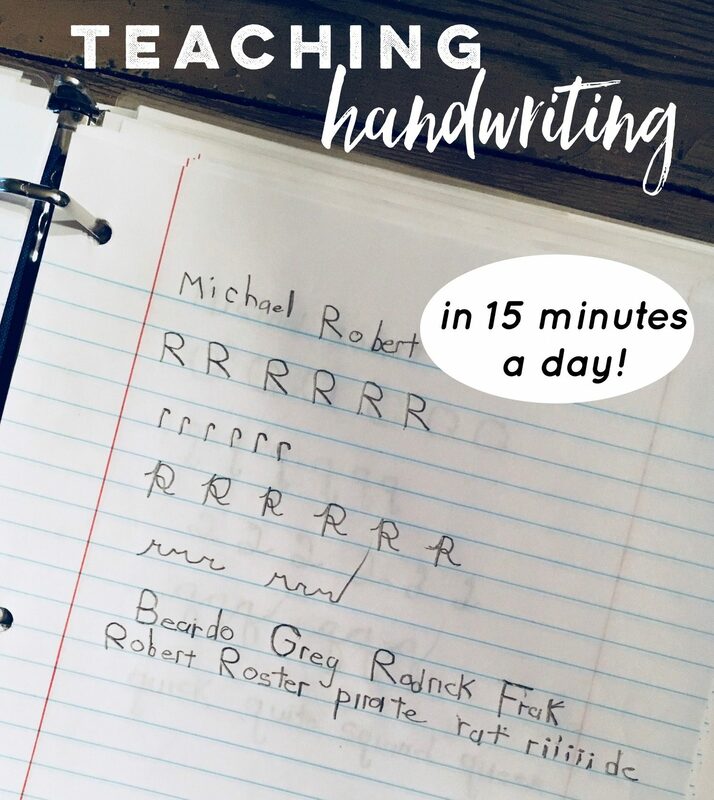 I started to implement this idea for the first quarter of this school year and not only is it WAY EASIER, but my children who have struggled with messy handwriting have improved more in the last 6-8 weeks than they did the entire last year! And it only takes about 15 minutes! Here’s how we do it! In the morning after we do our memory work (so we are already sitting at the table together), I dismiss the younger crowd. Cypress (1 year old) plays in the living room or in his pack and play and Cora (3 years old) usually goes with him. Occasionally Cora stays at the at the table with us and colors in her little workbooks (dollar store finds that I have collected over the years). While I am getting the littlest ones situated with toys my Prek/K, 2nd, 4th, and 5th grader get their paper and pencils and write their full (first, middle and last) name on the top line of their paper. The paper they use is determined by the grade they’re in. I use primary paper for the younger grades and when they hit 3rd grade or so I switch them to wide ruled. Note: My very first session is an evaluation so that I can compare it to when they have finished. I have them all write (in their best handwriting) the alphabet both upper and lower case and if they have already learned it, the cursive alphabet as well. White board instruction (2-3 minutes): I will draw a the top, bottom and dotted middle line that is included on primary paper. I then will very slowly (while explaining) write the uppercase letter “A” making sure I mark the spot where I started with an “x” or a large dot. This way, when they are practicing and they forget where to start the letter they can look to the board and see. Then I move on to the lower case version of the letter “a”. Then the cursive versions of each. Letter practice (5-8 minutes): The kids are then asked to write a line of their BEST upper case letters (I require 6 letters of each), skip a line, a line of their BEST lower case letters, skip a line, a line of their BEST upper case cursive letters, skip a line, and a line of their BEST lower case cursive letters. For kids that are JUST learning their letters , are new to cursive, or need a bit more help I offer then a sheet that has a traceable letters to guide them if needed. For those who haven’t learned cursive yet I only require the print letters. Word practice (remaining time): When they finish their letters I allow them to write any word they want as long as it has the letter “a” in it somewhere. This is where they shine! I usually write a couple of words they suggest on the white board so they can see them spelled out. Many times they take as many random words on the board as they can and try to come up with a sentence with them all. I allow my kids to be silly and have a good time with this. The word “poop” and “toilet”(and various other colorful words) come up as often as the letters in the allow! If it gets them to enjoy handwriting I am all for it! After we have cycled through all the letters we do another evaluation. We forgo the normal instruction and spend the 15 minutes carefully writing out their BEST alphabet (uppercase and lower case). I then compare it to the one they did at the beginning to see how much improvement has been made. Then we start the cycle over again. Usually this time around I will require the word practice to be done in cursive (and then next time I will switch back to print). You’ll end up cycling through the alphabet 4-6 times depending on how many times a week you do handwriting and how many weeks per year you school. For those who aren’t quite ready to print letters yet: While most of my kids have been ready to learning handwriting by this age, ,Ezra (just turned 5) is a lefty and both he and my other lefty tended to need a little extra time. During this time he traces pictures from coloring books or tracing sheets that I have printed off for him. THANK YOU for this post! I read it back when you first posted it and thought “huh, that’s an interesting idea.” It sounded too good to be true but I filed it away because it also sounded AMAZING. I haven’t even officially started with my first (five year old) because at heart I’m a “better late than early” subscriber but recently I’ve been introducing more “school” type activities to try get him ready for…I don’t know what. We’re planning on homeschooling and going slow. I don’t know why I’m rushing this. Peer pressure? Anyhow. We’re just starting Teach Your Child to Read in 100 Easy Lessons. So far it’s a flop – he hates being instructed. He hates looking at the book. (The pages ARE super busy with words.) We stumbled through another lesson today and finally I put the book aside, thought back to this post and said, “okay, why don’t you go ahead and write your favorite letters? Any ones you like, any ones you know” and walked away for a few minutes. He amazed me by cheerfully producing a clear “t”, “O” and “A”. This from a boy I didn’t realize even knew “t”. He then asked me how “Thomas” (the Train) is spelled and when I pointed the letters out on a chart, he reproduced them, in order, by himself to create his first word! Wow. I’m floored. So thanks for planting the seed of this awesome, uncomplicated writing concept in my mind! I think it’s going to get a lot of use in this home!